At 10-years-old, Oleg wrote an essay about his dream of working on Wall Street. That’s an unusual dream for a young boy…especially one who lived in Eastern Russia. But Oleg let nothing stand in the way of that dream. He worked hard in school, especially at learning English. By age 17, he won a scholarship from the U.S. Department of State to spend his senior year of high school in the United States. Before he could go, however, a swimming accident left him temporarily paralyzed. Still, he didn’t give up on his dream. One week after he got back on his feet, he was on his way to the United States. Oleg finished high school in Paw Paw, Illinois, and in 2013 enrolled at NIU, where he has excelled in every facet of his college life. He double-majored in finance and economics, with a minor in applied probability and statistics, and graduated in 2017 with a 3.9 GPA. Oleg created a nationally recognized peer-mentor program to help other international students adjust to college life in America. He traveled to Washington, D.C., to lobby for immigration reform. As president of the NIU Investment Association, he participated in the NIU Student Managed Portfolio, helping direct investments for a fund operated by the NIU Foundation. 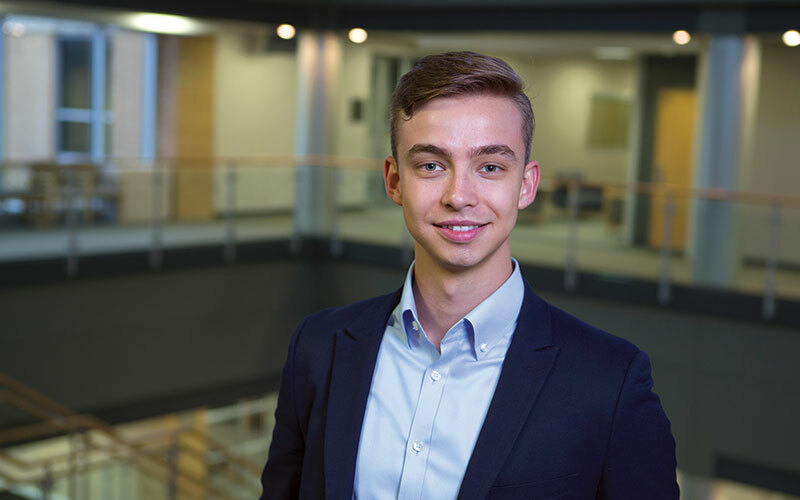 Oleg paid for his education through scholarships, and by working for the NIU Division of International Affairs and interning with AIG in Chicago and J.P.Morgan in New York City. Oleg crossed global boundaries to big opportunities in order to realize his dream of working on Wall Street. Immediately after graduation, he became an investment banking analyst for J.P. Morgan, a global financial institution located on Wall Street in Manhattan, New York.